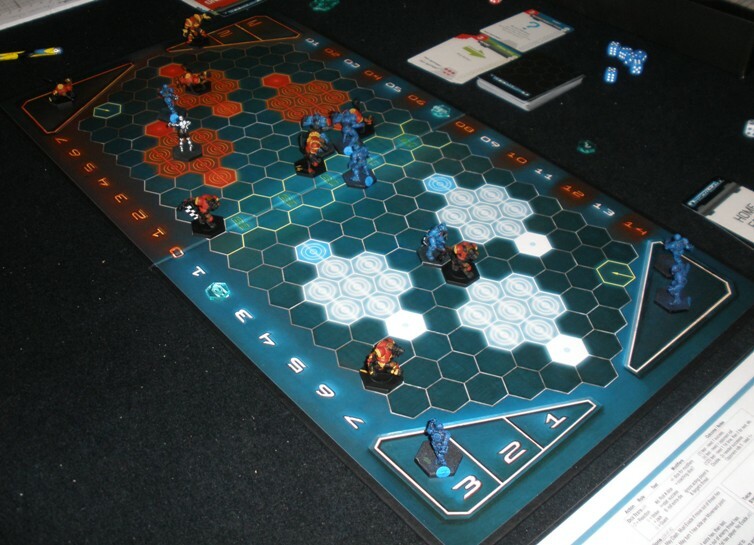 A number of my gaming group invested in Dreadball during the Kickstarter campaign last year. The game itself and the first batch of associated miniatures arrived just before Xmas. This weekend was the first chance that we had to put the game through its paces and so four of got together to compete for the first “Dean Cain Presidential Shield” (photo of the trophy to follow). I am pleased (and relieved considering that we put money into the project on spec) to say that we had good fun with the very lean and streamlined system. I reckon that we should get a lot of fun out of the rules as time goes by. 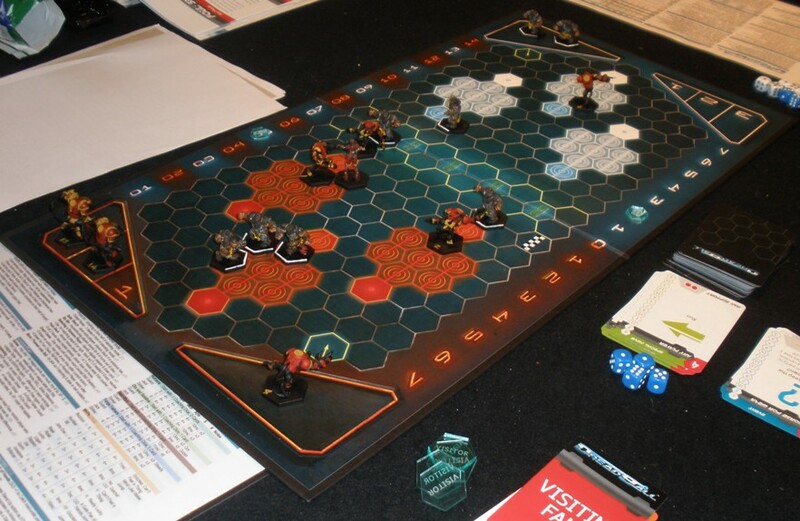 We had four teams available for the tournament, all of which were nearly, but not entirely painted/based. We will all have fully finished our first teams by the next Dreadball get together I hope. 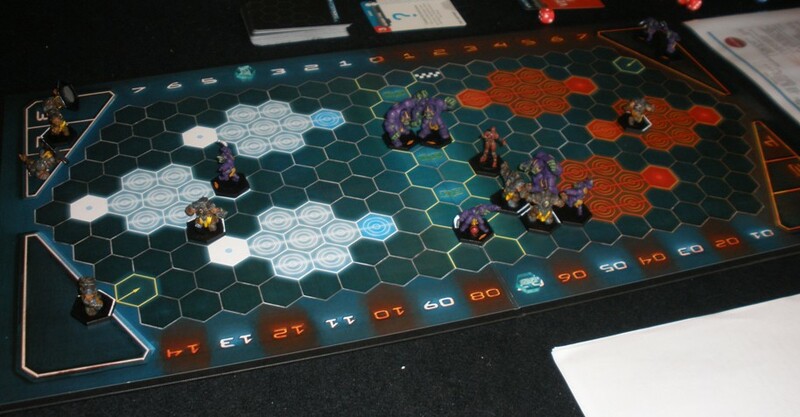 At time of writing I have my human team almost fully painted and I hope to get started on my other Dreadball figures soon, buoyed up by enthusiasm after enjoying this weekends games. Below is a shot of one of my finished O.C.P. Patriots human players, a striker. The Dreadball figures are a lot more like actual 28mm figures (rather than “heroic 28” or the ever increasing 30 and 32mm ranges available) than most that I have painted for years now. 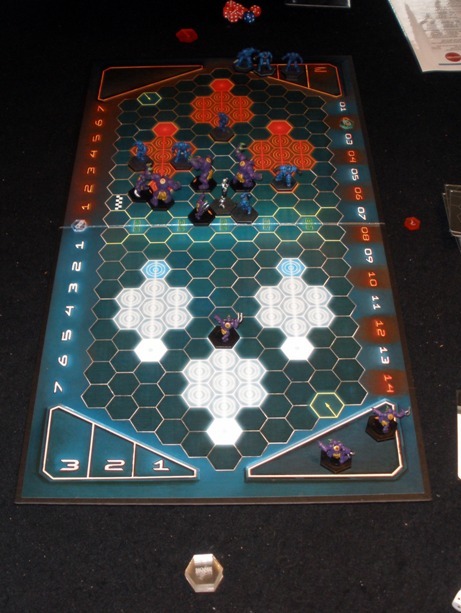 It has an effect on the figures compatibility with other ranges I suppose, but that wont be an issue with a set of sci-sports figures: I am unlikely to be fielding my Dreadball figures in my other miniature games anyway. 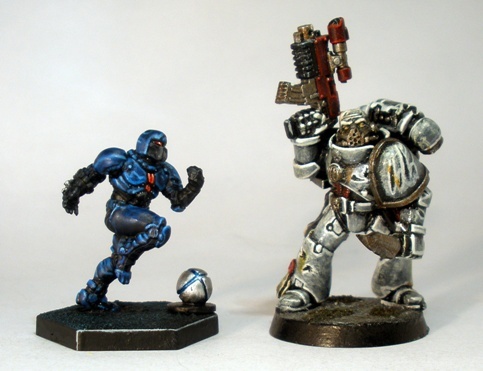 L to R: Dreadball Corporation (human) Striker, 40K Space Marine. The Space Marine looks “true scale”.